Back in September, All-Star Donuts in the Marina announced that they were closing after 28 years. Now, I've never been to All-Star Donuts. I don't live in the Marina. I didn't particularly care. Except ... a nearby restaurant was on my radar because they serve a bread pudding made from All-Star Donuts donuts. I'm obsessed with bread pudding, and always on the lookout for a great new version to try. If All-Star was closing, then my opportunity to get this dessert was going away. I had to act fast. Causwells is open for lunch and dinner daily, plus brunch on the weekends. The aforementioned bread pudding is from the dessert menu, which yes, is available at brunch (which is when I visited). I didn't actually stay for a meal, and opted to just grab my bread pudding to go, but they did have a couple tempting sounded dishes on the brunch menu, like buttermilk biscuits with sausage gravy or french toast bites with a brandy dipping sauce. Sadly, I didn't like my dessert, nor the subsequent one I returned for, but the feel of the restaurant was good, and I've ready many positive reviews, so I wouldn't rule out returning for a real meal. The feel of Causwells is very relaxed. Rustic, casual, lots of wood elements. There are a few tables inside and outside on the sidewalk, perfect for brunch, plus a counter along the bar. The tables don't really look comfortable however. 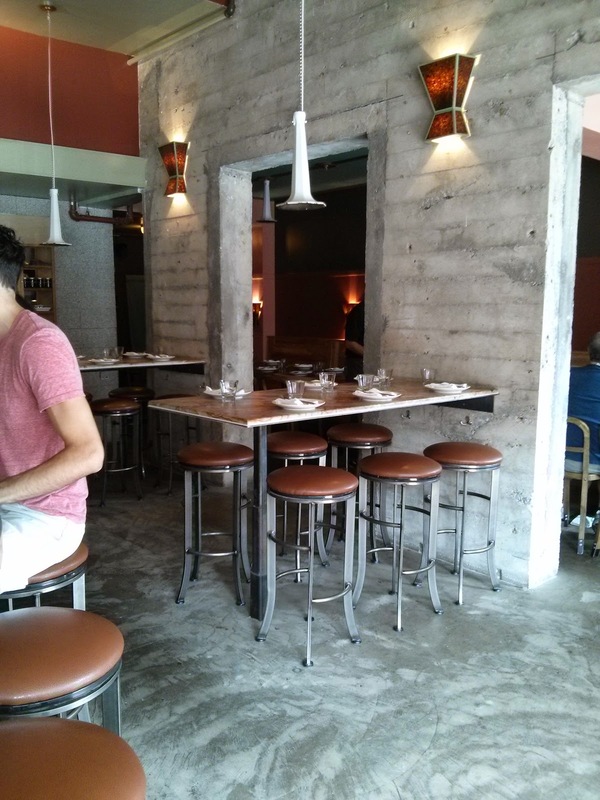 Stools are great at a bar, but, at a table? Too much work to sit up! 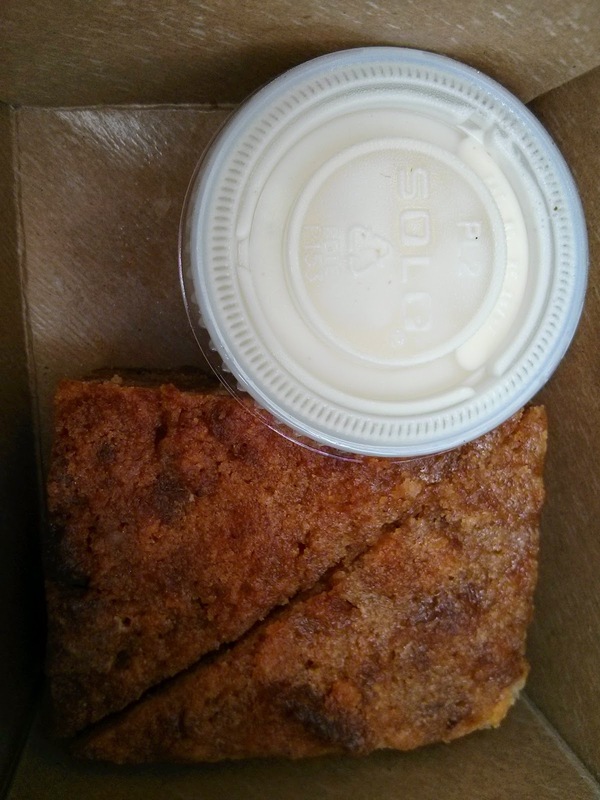 “All-Star” donut bread pudding / spiced milk. $8.25. Ok, I love bread pudding. It is one of my absolute favorite desserts. And donut bread pudding? It can be totally amazing. I was super excited to try this, as I'd read about it before. Bread pudding, made from donuts from All-Star Donuts down the street. YES! Then I opened my box. NOOOOOO! I like a certain style of bread pudding. I like a crispy top. A custardy, moist interior. Good size chunks of bread. Ideally served warm. Bonus points for serving with ice cream, but whipped cream will do. This was basically just dense, oily cake. No distinct chunks of bread/donut. No crisp top, no custardy interior. It did sorta taste like stale donuts though. The serving was two pieces, cut into triangles. Served cold (I verified, that is how it is served when you order it in the restaurant too, never warmed up). And, no ice cream nor whipped cream, instead, spiced milk. Now, the spiced milk was tasty, slightly sweet, lots of fall spices. I tried dunking the bread pudding in it to moisten it up, but, meh. I guess they were going for donuts and milk as a treat? But still. No. All around, just not my style at all. Sadness. Also, it turns out that they still serve the bread pudding, they just get the donuts from another All-Star location. I didn't need to rush there for it! I want to start a campaign to rename this style of bread pudding. Let's just call it bread-cake ok? I can't blame Causwells for serving this style that I dislike, as they aren't alone. Dense, cake-like bread pudding shows up all the time, like the flavorless solid mass I got from Soma Inn Cafe or the better, but still just solid-style version from Blue Plate. Sometimes it comes more like french toast, like the banana version we had at Lot 7. Seriously, these aren't what I think of as bread pudding! Even getting the name right isn't enough though, because the version from Luna Park sounded perfect on paper, it was warm and with ice cream even, but, it fell flat too. Sigh. So simple, but so hard. $8.25 was a fine price for a dessert, but I obviously didn't want this. Plum Foster Pudding / star anise / salted crumble. $8.25. If at first you don't succeed, try try again, right? Particularly when pudding is involved. I'm a sucker for pudding, so I couldn't resist trying it too. It was ... also not good. The pudding itself was grainy and flavorless. Not vanilla flavored, not creamy, a bit watery. The plums were mushy and just tasted weird. The crumble on top was a nice touch, and I did really like the idea behind a crunchy component to a pudding, but it wasn't particularly flavorful either. It did have a touch of salt at least. The star anise however was flavorful, but it overwhelmed everything else. I brought it to Ojan, since he also likes puddings, but he took one bite, made a face, and threw it out. Belle Isle is a casual seafood restaurant located only about 15 minutes from Logan airport. Thus it has become my goto location for a quick bite when flying in or out of Boston. If I'm just arriving in Boston, I'm likely starving from my flight, and eager to get my hands on some east coast seafood as soon as possible. If I'm about to leave, it is my last chance to have fried haddock! Belle Isle is a very casual place; you order and pay at a register, cash only, and are handed a lobster shaped buzzer. Soft drinks are self-serve, basic Pepsi (or was it Coke?) products. Seating is actually at picnic tables, although they are indoors. Food comes on paper plates. Like I said, casual. It is located right along the water, with rather nice views. You do almost feel as if you are at a seafood shack on the coast, rather than so close to the city. There is also a Dunkin' Donuts conveniently across the street, so you can get your first/last Dunkin' Donuts fix at the same time. I've visited many times over the years, but I didn't take photos or write reviews for the first few years, because it was before I decided to add Boston area reviews to my blog. Thus, I only have specific details on a few menu items. The menu is basically all seafood. The selection spans everything from haddock, sole, swordfish, salmon, and tuna to oysters, clams, shrimp, or calamari, and of course lobster, or lobster pie. Once you decide on which type of seafood you want, there are still many decisions to make. Most items can be prepared fried, baked, baked and stuffed, cajun blackened, grilled, or teriyaki. The fried plates come with french fries, onion rings, coleslaw, and tartar sauce. Yes, you read that correctly, not a choice of those things, you get them all. The others all come with rice pilaf, coleslaw, tartar sauce, and dinner rolls. Portion sizes are rather insane, which I knew before my first visit from my research. Sharing is highly advised. Every person who I've brought there has been fairly resistant to my suggestion of sharing, and then once we receive the food, has thanked me. I'm pretty sure we've never managed to finish everything, even with sharing. Anyway, back to the menu. If you don't just want a seafood dinner platter, they also have seafood rolls and sandwiches (including several styles of lobster roll depending on what sort of meat you want), crab cakes, fish cakes, and, for the token non-seafood eaters, chicken fingers and hotdogs. Belle Isle also has a retail seafood counter, to purchase fresh seafood to cook for yourself, or, in our case, cooked and clean shrimp. There are obviously much better restaurants I could visit for seafood in Boston, but Belle Isle also has a large parking lot, and isn't located in Boston proper (it is in neighboring Winthrop), so my family members who don't want to drive (or park) in a city don't need to. They don't take reservations, so if my flight is late, I don't need to worry about being late. If I've just gotten off a plane and don't really want a long, drawn out meal, it is fast and easy. It really is just quite convenient, and while the airport location of Legal Seafood is more convenient, the food is far better at Belle Isle. I wouldn't go out of my way to go there however. It is also pretty pricey for a casual place. 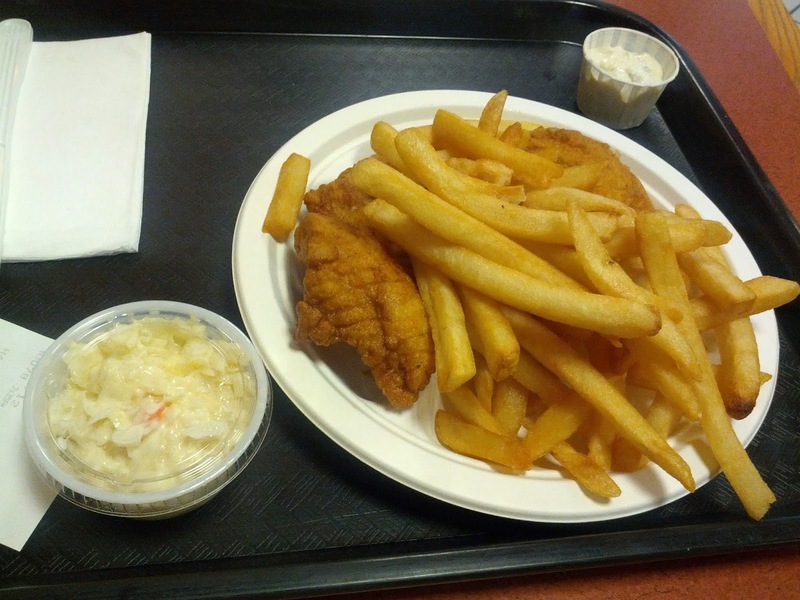 I nearly always go for the haddock, because it is something we do not have on the west coast. Swordfish, salmon, tuna, calamari, scallops, etc are all things I enjoy, but, I can get them regularly. Fried haddock on the other hand, now that is special! (which I realize is funny to people from the east coast, as haddock and cod are just the basic common whitefish readily available, and to me, they are gems). I also nearly always get it fried, because, well, fish and chips. Somehow a piece of grilled haddock doesn't have the same feel of indulging in my special seafood. I am really curious about the baked stuffed version though, and always say I'll get it "next time". A fried dinner comes with onion rings, fries, and colelsaw by default, but after hating the onion rings on all our previous visits, we asked to just have fries this time. The fries were fresh but not remarkable. They were not very crispy, yet were not soggy either. They weren't too oily nor greasy. But ... somehow they just weren't great. They certainly needed salt. My notes from previous visits all just say "meh, skip in the future". The portion was huge, but, normally, half of this is onion rings. The slaw comes in just a little plastic cup on the side. It is mayo based, creamy, fairly generic, but, tasty. It has been highly inconsistent in its freshness over our multiple visits however. Sometimes I've noted that it is quite crisp. Other times it has been incredibly soggy. I had to write down a quote from a fellow diner once, when he had a bite of the slaw, and said, "Why did they use lettuce instead of cabbage?" It was so lacking in any crispness that he couldn't tell the difference, and even when I insisted it was cabbage, he was skeptical. Still, it is my style of slaw, and well seasoned, making it my favorite of the sides, but of course, I would prefer it less soggy. And finally, the haddock itself. The haddock dinner comes with two very large pieces of haddock. It arrives very hot, clearly fresh out of the fryer. The batter used on the fish is the same as on the onion rings, where I find it really doesn't work, as it is too heavy for the onions, but it works much better on the fish. It still isn't remarkable, but, much more successful than on the rings. The haddock itself was moist, flaky, very good. Exactly what I wanted it to be. Of course, I'm in it for the sauce. The side of tartar sauce was the highlight for me. Very thick, loaded with chunks of pickles. Good flavor, and it went very well with the fish. Also good for dunking the mediocre fries in, although, they always only give one tiny container of it, which isn't enough for even just the fish, let alone some fries or rings. Or uh, maybe I use an excessive amount of tartar sauce? I've always had to ask for extra. Overall, this always meets my craving for some fried seafood and mayo, but, certainly isn't anything remarkable. Scallops, Baked, Side Order. $13.99. Scallops were a bit of a strange pick for me, as I was on the east coast, and my thing is always that I want to pick the special thing I can't get in San Francisco. I obviously love scallops, but get them fairly frequently in San Francisco. Shouldn't I be going for the haddock or lobster? But ... I'm just not a big fan of lobster. I've had the lobster roll from Belle Isle on two other occasions, and others raved about it, but to me, it just isn't ever going to be my top pick. (And, on this visit, another diner got the lobster roll, and I did indeed have a few bites. It was ... just a lobster roll. An insane amount of lobster, lightly dressed, but ... the lobster was a bit chewy, and the flavor just isn't there in lobster meat for me). I also wasn't in the mood for fried food, as I had just stepped off a plane, and wasn't feeling great, so my default fried haddock wasn't sounding appealing in any way. I could have chosen grilled or baked haddock, but that seemed boring. 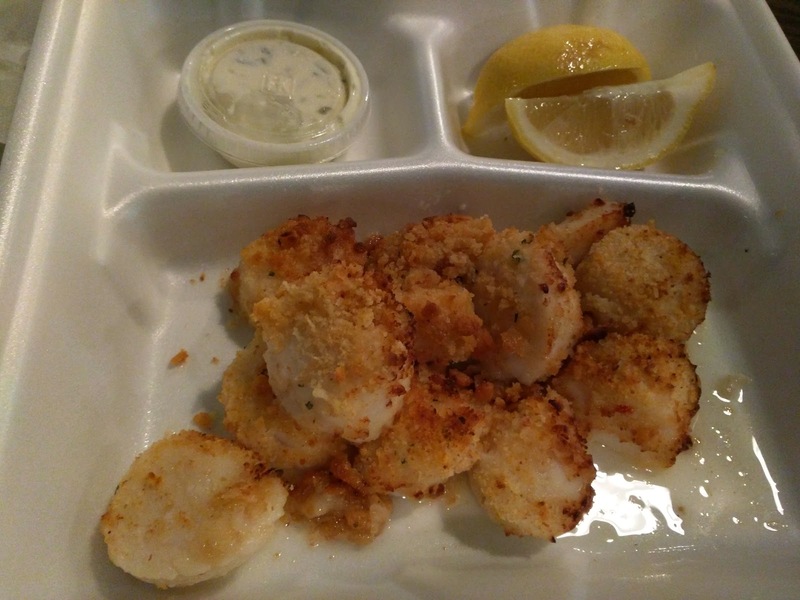 Plus, I realized, aren't most scallops fished right off the coast of Massachusetts anyway? These were just as local of a choice as lobster or haddock! So, scallops it was. After trying unsuccessfully to convince the rest of the group to share a few dishes, I gave up. Each adult ordered a full dinner, as did the children. At last minute, one person decided to cancel his order entirely, since he knew how much food we'd be getting. I decided to just get my scallops as a side order, knowing I could steal some fries, onion rings, and slaw from the others. Plus, on previous visits, I didn't really like the sides all that much anyway. The scallops were a wonderful choice. They turned out to be, by far, the best item I had at Belle Isle, in any of my visits. Sure, the scallops were mid-size, and I prefer larger. And they were baked, and I prefer seared. They were cooked all the way through, and I prefer mid-rare. But ... they tasted good. Tender, slightly sweet. They were cooked with plenty of butter, I assure you. And topped with some slightly crispy bread crumbs for a little crunch. On the side was lemon slices which I squeezed over the scallops, which enhanced the flavors a little, but quite honestly, wasn't necessary. And tartar sauce, which is usually the highlight for me, and, believe me, it was good, but the scallops were actually better on their own, sans sauce. The only negative I have to say is that some of the scallops didn't have the foot removed, so it was a bit unpleasant to occasionally encounter the chewy bit. Lobster Tail Roll with Onion Rings. $30.99. On my first visit with my mother, I knew there was only one thing she'd have eyes for: a lobster roll. She loves lobster rolls, and only ever gets to eat them when she goes for her annual trip to Maine with my father. This was a serious treat for her. I also knew, that like everything at Belle Isle, the portions were going to be huge. She proclaimed up and down that she could eat a whole lobster roll and we shouldn't split, but, I assure you, it is a good thing we did. This is no wimpy little lobster roll. It is absolutely loaded up with lobster, large chunks of lobster, not shredded, not bits and pieces. A full half pound. There is no filler, besides some mayo, but it isn't overdressed. For a lobster roll, this is a very good lobster roll. But ... a lobster roll is never my thing. First, I don't love lobster, to me, it just never is as good as our local Dungeness crab in San Francisco. The lobster at Belle Isle has been no exception, it just doesn't have that much flavor. Well cooked, generous serving, but ... it is lobster. Also, I don't really like sandwiches, so the whole "roll" aspect of it is a negative to me too. As for the onion rings, I've had those many times, and somehow keep trying them, even though I really dislike them. They are fresh and crispy, but the breading just doesn't work for me for onion rings, and I actively dislike them every time. I love onion rings, and they always look so good that I can't resist, but I really, really don't like them. My dining companions all love clam chowder, so one time when they were with us, someone added on a pint of clam chowder to our order. Again, I tell you, no one trusts me on the portion sizes here! Anyway, it had good chunks of potato, plenty of clams, and was decently creamy. It came with a packet of oyster crackers. It wasn't really my thing, but everyone else enjoyed it. I love attending cooking demos all over town. I don't generally blog about them however. On Saturday mornings, I often attend demos at the Ferry Building Farmer's Market. The range of chefs, and dishes prepared, is varied. Some are chefs from out of town visiting on cookbook tours. Others are high profile chefs from around town. Some are a bit boring, others are highly entertaining. Most are savory chefs, but every once in a while, we are in for a treat. A sweet treat. 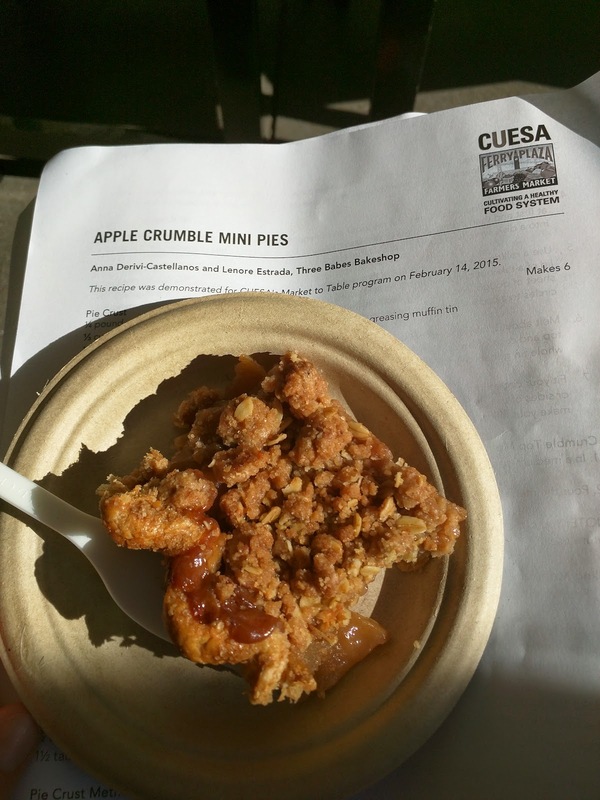 On those days, since I'm a dessert-o-holic, I make extra sure to attend, like when Kara from Kara's Cupcakes does demos, or whenever Yigit Pura pops up around town. For Valentine's day this year, the ladies behind Three Babes Bakeshop were there demo pie. I obviously had to attend! As always, the demo was outside in the open demo kitchen that Cuesa, the organization that runs the farmer's market, sets up. The presenters, Anna and Lenore, were so much fun. They are the "babes" who have been friends since childhood and started Three Babes Bakeshop together. They live together, work together, and have known each other for years, and somehow still seem to get along! Amazing. 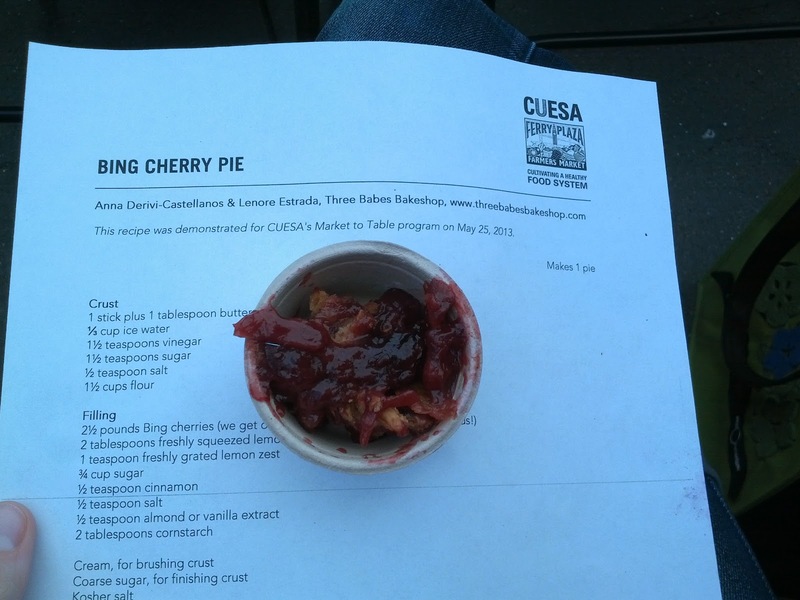 They provided a slew of tips about pie making, and did it with a batch of humor mixed in. Three Babes does not have a local retail store, but many of their pies are available for delivery via GoodEggs, which I just recently started using. They also have a stand at the weekly Ferry Building Market. They sell mostly whole pies, but you can also purchase just the dough to make your own pies without doing the most daunting step. If you are super ambitious, you can get a 3, 6, or 12 month "pie subscription", which delivers one pie a month! The range of pies available is extensive, including savory pies, nut pies, cream pies, custard pies, and fruit pies, with just about every single type of topping (double crust, lattice, crumble, etc). They also like to throw in some bourbon. I like them already! After the demo, we were all given samples. I wouldn't say that the samples are the ONLY reason I attend the demos, but, they sure don't hurt. And these were not just little tiny sample cups to entice us to go buy a slice from their stand. These were full pieces of pie! Even MY family would consider these full slices. So generous! The crust was downright amazing. So flaky and buttery. I know butter worked properly into the dough is the secret to a good crust (and perhaps the apple cider vinegar too? ), but wow, these ladies have nailed it. Perfect crust. I see why they sell just the crust! Seriously, I didn't need the rest of the pie, just the crust and I would have been happy. The filling was classic apple, which they recommend pre-cooking slightly before baking to ensure that the crust and filling are both done at the right time. No undercooked fruit here, nor burning the crust in order to finish the baking of the fruit. They clearly care about getting the details right. And, they were, the apples were perfect, not mushy, not too firm, well spiced. They could probably sell their pie filling too! 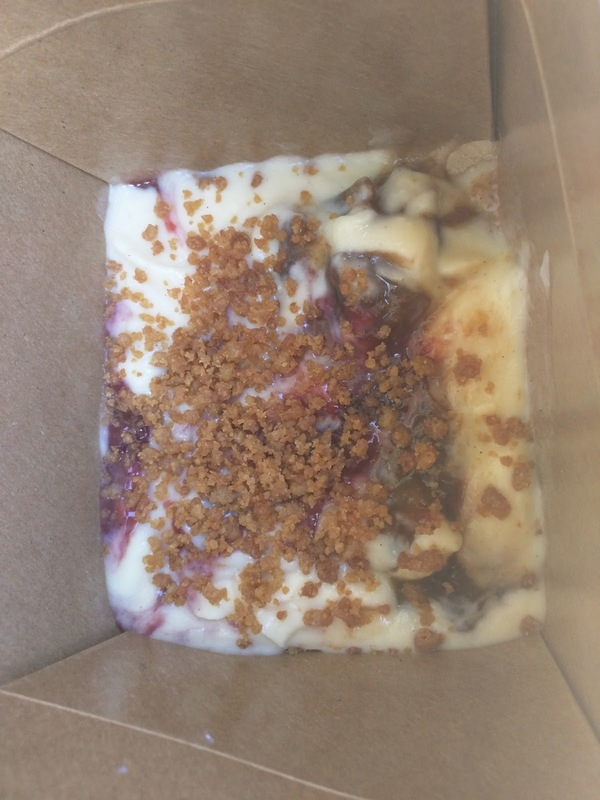 And finally, the crumble topping, which was everything I always want a crumble topping to be. Crunchy, sweet, decadent. Butter was likely the key here too, but, if you are having pie, you might as well have GOOD pie. This was great, and I look forward to trying more of their pies. They also did a demo back in May of 2013, and somehow, I took a photo and notes then too. I recall the demo then being just as fun as the recent one! The sample however was just a small cup, hence why I expected just a small sample at the recent demo. It was an awesome pie. The crust was buttery and decadent. The cherries were super cooked down and almost caramelized. And ... the previous May too! These ladies give back to their community! Mixed Berry Rhubarb Crumble Pie. Like I said, they make a lot of different pies! 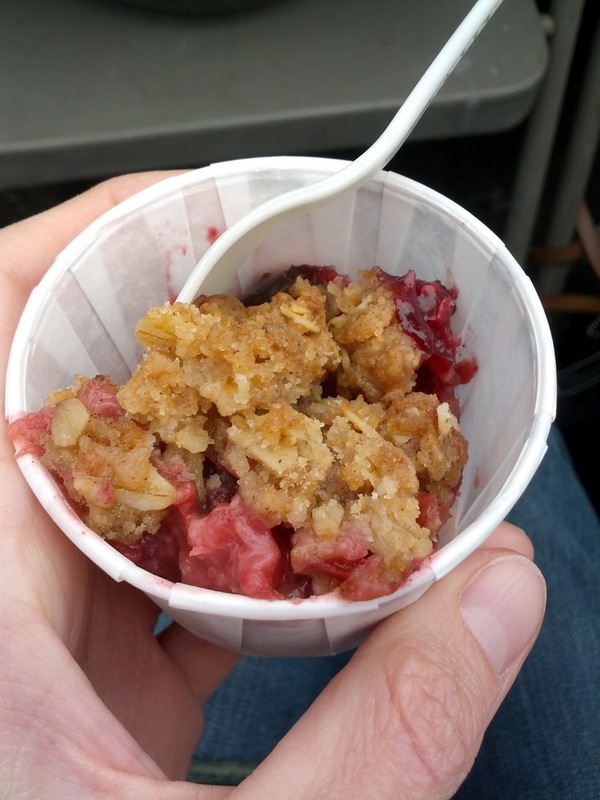 This was a mixed berry (strawberry, blueberry, raspberry) with rhubarb, and the same great crumble topping. I don't have notes from way back then though, and again, the sample was just a tiny cup (which is totally normal and expected). Enjoy Life is a company that sets out to make products that can be enjoyed by anyone, worry free. What they mean by this is that their products are gluten-free, nut-free, soy-free, dairy-free, basically, all-the-allergens-free. And of course non-GMO. They make cookies (both soft baked and crunchy), cereals, seed & fruit trail mixes (no nuts! ), snack bars, chips (called Plentils, stay tuned for that review), and ... chocolate. For chocolate, they offer baking chocolate (chips or chunks), plus bars. I've only had the chocolate bars, called "boom CHOCO boom" (I have no idea why). They make 3 varieties of chocolate bar: a regular dark chocolate bar, a milk chocolate bar made with ricemilk, and a ricemilk crunch bar. 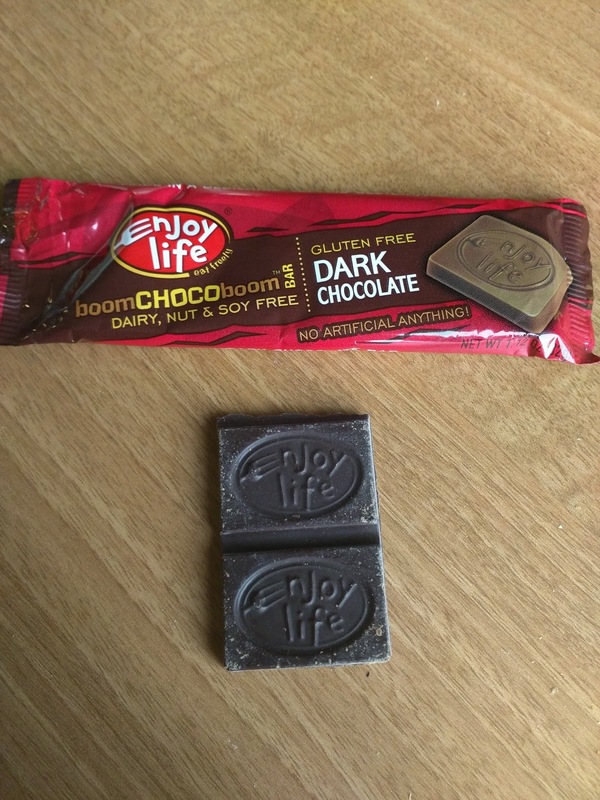 The chocolate was actually good, but sadly, like so many allergen-free items, something was clearly just a bit off. As I have no reason to avoid any of these allergens, I won't be seeking out more of their chocolate. boom CHOCO boom Dark Chocolate. The flavor to the chocolate was quite good, it tasted "smooth" if that makes any sense. Another taster remarked that it had the enjoyable taste of a dark chocolate, except that it was somehow sweeter than most dark chocolate. Basically, you had some sweetness, but you could also taste the cocoa. We wondered what percentage it was, and that information was no where to be found on the packaging nor the website. But, the texture wasn't right. It didn't have a nice snap to it, and it was a bit chalky. Sorta even crumbly. Another taster dubbed it grainy. None of us could get past the strange texture.